It is coming back to me. After many years of doilies and shawls I am remembering how to knit something that actually fits without all the trial and error I have been going through lately. When I knit sweaters for the theatre I would always check the math before I knit anything. It was just too important and I didn’t have all the time I do now. Being paid for something makes one take precautions that don’t seem so important when making personal things. So in this vain of thought I measured my foot. Then I multiplied my sock gauges, both 7.5 and 8 stitches per inch by the various measurements. 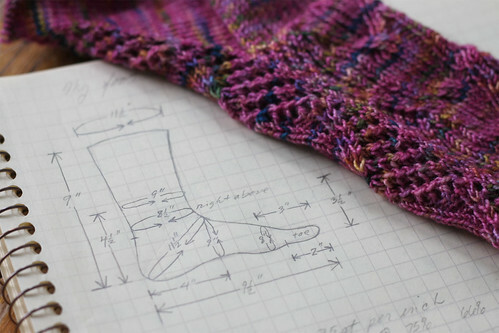 Nancy Bush in her book “Folk Socks” mentions that you should cast on with 25-30% less stitches than the stockinette gauge would suggest. So I did the math and found out that for my feet the stitch count in Cookie A’s book is the minimum that I should use. That is why the socks I have been making feel like sausage casings. I can get them on; they just are not comfortable. I will frog these pink socks and save the yarn for a pattern that I know will fit. This entry was posted on Friday, June 12th, 2009 at 3:00 am and is filed under Knitting. Tagged: Knitting. You can feed this entry. You can leave a response, or trackback from your own site. Love seeing how you drew out the dimensions of your foot. I’m going to investigate the method you’re using, it would be SO helpful for knitting socks for other people!